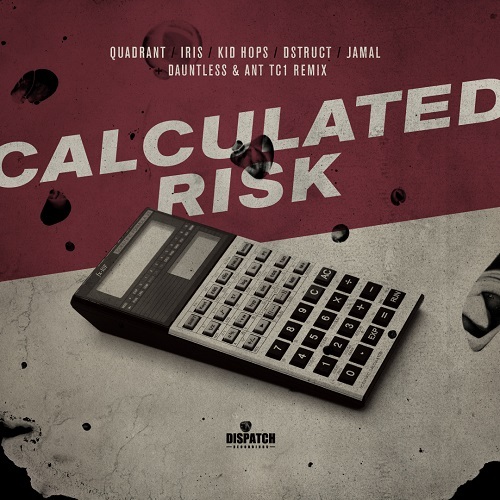 Delivering some fresh flavours from the West Coast, we welcome Seattle’s finest Quadrant and Iris back to Dispatch with the ‘Calculated Risk EP‘. Showcasing some exceptional US talents, additional production comes from Seattle neighbours D-Struct and Kid Hops, plus a debut from San Francisco’s own Jamal. The ‘Calculated Risk EP’ is meticulously constructed but shrewdly balanced, as Quadrant brings hard hitting technicality, crafted with composed progression. Dauntless & Ant TC1 also join forces on opposite sides of the globe for the superb remix of ‘Microsleep’, naturally closing an EP which demonstrates the shared passion and direction amongst Quadrant, Iris, their closest friends and Dispatch today. Quadrant, a.k.a Leigh Caplan, has been writing quality Drum and Bass for nearly a decade. From his humble origins as a hungry young producer in a Philadelphia basement, to his current status as a respected artist on the worldwide scene, the goal has always been the same: make music that he is proud to call his own. Originally a four-person collective, having gained modest notoriety for their bootleg of Faithless’s “Crazy English Summer”, 2005 saw Quadrant’s debut release, “Arachnid”, on the legendary UK label Renegade Hardware. During the next year, they released three more tunes on Hardware, most notably “Manipulated Living” on the Carpe Diem LP, a track that hasn’t left many DJs’ crates since. Following these initial successes was a highly respected slew of appearances on Triple Vision labels Citrus and Fokuz, showcasing equal proclivities for dancefloor impact and melodic beauty– a rare combination in a genre that so often seems to favor one at the expense of the other. Iris was introduced to electronic music at age 13, when she first heard “Insomnia” by Faithless on Seattle’s C89.5. Since then, her love affair with the music has only intensified as she has honed a diverse set of tastes and an equally exacting repertoire of skills behind the decks. Her journey has taken her from UK Hard House, into the sounds of Trance and Progressive, finally culminating in her current focus of Deep Drum and Bass, Techno. Iris has recently started collaborating on original productions with DnB veteran Quadrant. Their first tune, Anthropocene, was spotted immediately by none other than Goldie himself, and snapped up for the Metalheadz Genesis EP volume 4. Other collaborations, with Quadrant and local legend Kid Hops, have been picked up and supported by Total Science for their CIA imprint, as well as Hospital Recordings, and Italian label Avantgarde. With an ever growing arsenal of original productions, a host of exclusive tunes from the hottest producers around the world, all held down by meticulous mixing and track selection, Iris is a force to be reckoned with. I LOVE DRUM & BASS Spotify Playlist.